Project Denneler: "See grandma, you just touch the monkey." 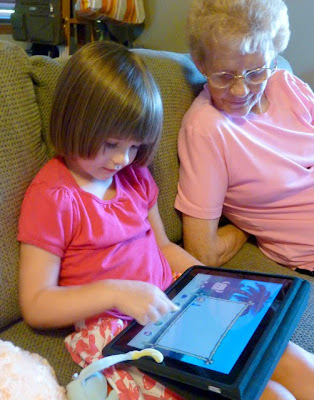 Our 3-year-old Bea enjoyed showing her 73-year-old Grandma Nette how to use the iPad this weekend. Her favorite preschool app is called "Lunchbox". I never imagined that Eric's new toy would become our go-to-gadget for bedtime with Bea. We're able to read books, play puzzles and do all kinds of preschool games with it. In fact, it's the only incentive (bribe) that gets her to take a bath and get ready for bed. Which is increasingly difficult on these long summer days when the sun doesn't go down until 9:30!